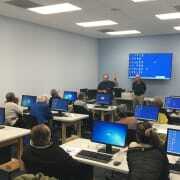 We are looking for Teachers and Teacher Assistants to teach basic internet skills to senior adults. Classes are held throughout Broward and Palm Beach Counties. Locations include but are not limited to: Delray, Fort Lauderdale, Boynton, Deerfield, Hallandale, Pembroke Pines and Tamarac. Class times are Mon and Wed, or Tues & Thurs Contact us to learn more. Teacher position is up to 6 hours per week. Assistant position is 3 hours per week. Experienced to lead skills in basic word processing, internet searches, receive and send gmail, google maps and YouTube .